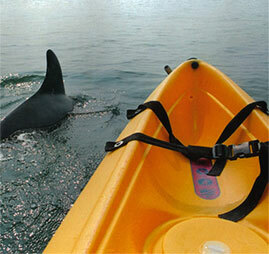 Founded in 1996 as Chesapean Kayak Tours, we were the first company in Virginia to offer guided kayak dolphin tours. Twenty years later we have proudly conducted more kayak dolphin tours than any other outfitter in the United States. Pioneering our way forward and operating as Chesapean Outdoors, we now offer stand-up paddle-board tours, bike tours, surf lessons, rentals, adventure camps, corporate outings and team building events for groups of all sizes. We first signed up to do the dolphin tour and were so excited to experience it that we showed up 1 day early to get a preview of the tour. We met Matt and he is a great guy! He took the time explaining to us how the whole thing worked and got us very comfortable as it was going to be our first time going out to sea in a kayak. While there, we also saw him give surfing lessons and we were so excited by it that we also signed up for surfing lessons as well. We stayed an extra day in VA Beach just for it! We enjoyed both the dolphin tour and surfing lessons a lot! We will definitely sign up for more activities with them in the future when we come visiting again. Thanks again Matt, Katie, Trey and Martin! Wonderful tour! Went out on the morning tour this morning and had an excellent time. Dolphins were everywhere, the guides we had were very knowledgeable and handled everything very well. I would definitely recommend taking this tour whenever you have the chance. Guided Dolphin Tour – One of the BEST experiences. The staff was so friendly, easy to work with, and was flexible with our traffic situation. Good instruction on and off the kayak. We got a chance to have a one on one session and it was absolutely amazing! Highly recommended. Paddle Boarding Fun – My husband and I had a great time paddle boarding in the bay. Our guide, Ainsley, was fantastic and really made the trip fun. She was patient with us as we were learning and made sure we had a great ride! It was such a great experience that I think we will get some boards for ourselves. I would definitely recommend this trip to others! My wife and I rented kayaks for an early season paddle while visiting Virginia Beach from New England. Everything went as advertised. Two boats were delivered on time the paddles and PFD’s were fine we received good directions and most important enjoyed our day on the water! Over the past several years, Chesapean Outdoors has provided my camps with a fun and educational experience. Our older kids enjoy kayaking along the shore of the Atlantic in search of bottle-nose dolphins while the younger ones enjoy paddling among the ospreys, crabs and rays of Broad Bay. The guides are knowledgeable and attentive to the needs of our campers. I would recommend Chesapean Outdoors to anyone looking for an Adventure!